A flock of great blue herons descending through a snowstorm to the streets of New York. . . . A river in Nebraska disappearing mysteriously. . . . A ghostly herd of buffalo that sings a song of death. . . . A mystic who raises constellations of stones from the desert floor. . . . All these are to be found in Winter Count, the exquisite and rapturous collection by the National Book Award-winning author of Arctic Dreams. 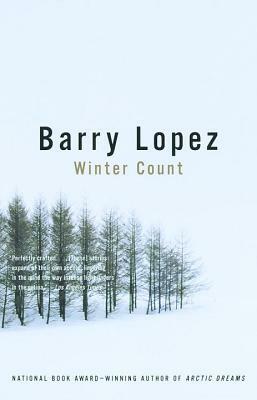 In these resonant and unpredictable stories Barry Lopez proves that he is one of the most important and original writers at work in America today. With breathtaking skill and a few deft strokes he produces painfully beautiful scenes. Combining the real with the wondrous, he offers us a pure vision of people alive to the immediacy and spiritual truth of nature. "Richly allusive, moving, compassionate, these stories celebrate the web of nature that holds the world together."